Do you feel like Virtual Reality could be so much fun by making use of your body motion to manipulate the objects? Well, your dreams of experiencing and controlling the virtual world seem coming true with a product ready to enter the market named ‘ Holosuit’. Kaaya Tech is a startup focused on changing the way people learn and interact in the real and virtual worlds. HoloSuit is the first product from Kaaya Tech – the world’s first affordable, bi-directional, wireless and easy to use full body motion capture suit. With options for 26 or 36 embedded sensors and nine haptic feedback devices dispersed across both arms, legs, and all ten fingers combined with six embedded buttons, HoloSuit captures the user’s entire body’s movement data and uses haptic feedback to send information back to the user, for scenarios including sports, healthcare, education, entertainment or industrial operations. HoloSuit was started when the founder got a fitness challenge in their Microsoft Research team. They were supposed to wear the fitness tracker and perform exercise and whichever team had maximum calories burnt would get the team reward. After doing rigorous yoga for 2 hours, the fitness tracker said: “2 calories burnt!”. That was the moment when the founders decided that we cannot have fitness trackers which hallucinate data and treat headstand and leg stand the same! 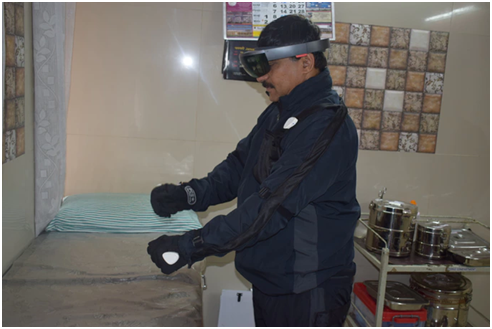 So they created HoloSuit which tracks all the body joint motion accurately, so that you will know exactly how your body moved when you did the workout – whether yoga, karate or cricket. You can store it and review it in 3D and watch your progress in fitness over time. VR and AR are becoming more immersive and natural as resolution field-of-view increase while the latency decreases. But the controller remains the Achilles heel of mixed reality, with cumbersome and unnatural handheld devices only tracking your hand movement in a limited range. Here’s is the solution for that. HoloSuit provides you an unparalleled immersive, full-body and bidirectional AR/VR/MR experience. The product goes well beyond gaming and is so powerful that it can be utilized for real-life, mission-critical situations such as sports, education, neuro-rehab, combat training, surgery, and even filmmaking. Perfectly suited for indoor and outdoor use, the fashionable, lightweight and affordable four-piece suit starts at Rs. 7000 for a single finger glove and scales up a pro version consisting of a jacket, pants and two gloves. It will be available in different sizes, is machine washable and can be sold as separate items or as a complete suit. It also features nine integrated haptic exciters that provide physical feedback to the user. HoloSuit can be connected to and used with all kinds of devices, including PCs and smartphones, as well as VR hardware like HTC Vive, Oculus Rift/Go, Microsoft’s HoloLens, Samsung Gear VR and more – entirely over Bluetooth LE & Wi-Fi with no wires to connect. The HoloSuit team is comprised of 15+ stellar AR/VR, IoT, and Robotics experts dedicated to developing precision motion capture solutions for immersive VR applications, film production, education, and mission-critical applications. They have over 37 patents from around the world in AR/VR, robotics, human-robot interaction, sensor fusion. As any product based startups, they require funds for carrying out activities such as mechanical RnD , sourcing and a lot more. Currently, they are participating in an ongoing event by Catapooolt for raising money through crowdfunding. Top 15 startups will make it to the investor’s table pitching their ideas. Holosuit is already being used to help people with disabilities to regain their body motion and to help kids to train them for sports. The scope and market for the product are so huge ranging from village kids, helping defense forces to enable virtual labs to conduct experiments. The startup is focusing to revolutionize the era of the virtual world. They need your support in making a difference in people’s day to day life. So if you want to see more sportspersons bringing medals for your country do contribute to Holosuit. Early adopters can pre-order HoloSuit components or an entire suit on www.catapooolt.com/holosuit. Next Post Gamicopter: Build Plug-n-Play, Rich Feature Gamification Apps in Minutes – without coding!